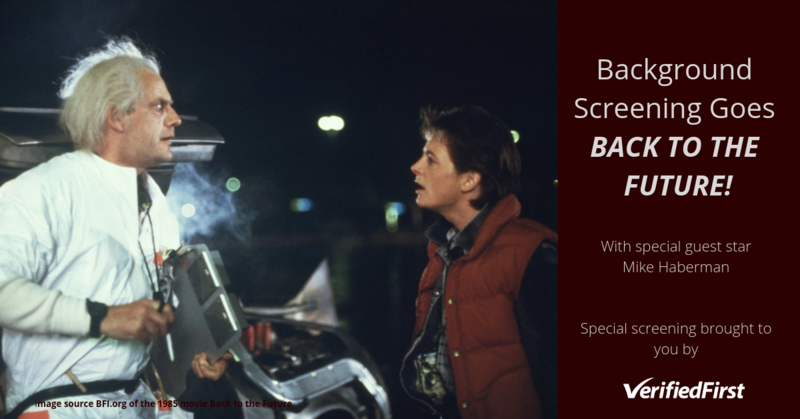 An interview with industry veteran, Mike Haberman and guest appearances by the ‘cast’ of the Back to the Future movie. Mike Haberman is an HR expert and consultant with over forty years of experience in HR as a practitioner and consultant. As we started the year, we sat down with him to go back in time and talk about how the world of background screening has changed, and forward in time to peek into the future. Verified First: Tell me about your experience with background screening. Mike Haberman: I’ve been in human resources for about 40 years, both in corporate positions and as a consultant. One of my earlier jobs was a recruiting manager for a manufacturing company, and back then we focused largely on checking references as part of the hiring process—that was considered a good-enough background check. Verified First: How did the practice of “true” background checks emerge? Mike Haberman: People started objecting to just doing reference checks as they began to realize they were getting only one side of the candidate’s story—the subjective side. With opinion weighing heavily in the decision to hire a candidate for a job, those seeking employment began suing companies for things like defamation of character and libel. S.S. Strickland: As I’ve said before and I’ll say again, I've never seen you before in my life, but you look to me like a slacker! Verified First: How did the companies react to the change? Mike Haberman: Companies started putting policies in place that only permitted references to be provided by the HR department. As a result, all HR was able to do was to confirm whether the candidate was employed there, and nothing more. Doc: More needed to be done. Hiring organizations were just was not thinking fourth dimensionally! Verified First: How did you and other HR professionals react to this? Mike Haberman: Instead of personal references, we started using background checks to confirm things like degrees, criminal records, and driving records. For me as a recruiting manager, tracking down all this information was not the most effective use of my time. So, we started moving to hiring third-party organizations to conduct background checks. George McFly: And that’s where I say I’m your density. I mean, your destiny. Did I mess that line up again? Verified First: What are the reasons some companies avoided background checks? Mike Haberman: The FCRA has so many strict rules that many companies just quit doing background checks to avoid worrying about compliance. I think that’s a major mistake. I remember reading it was considered to be insulting if you didn’t take a candidate’s word for where they worked and the nature of what they had done. But today, you’re playing with fire if HR doesn’t conduct due diligence. Verified First: When did it feel like background screenings became the norm? Mike Haberman: They were starting to become mainstream in the late 90s to the early 2000s. And now today, technology has developed enough so that background checks are much easier to do. 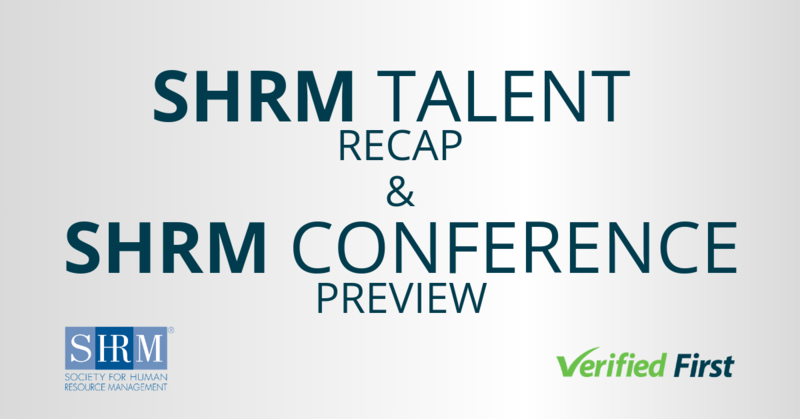 You can now get results in 24 hours, so it doesn’t slow down HR’s decision making. 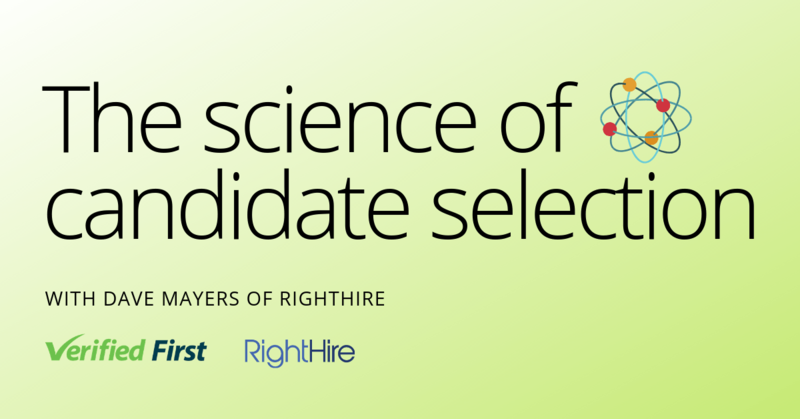 A lot of companies do a pre-employment screening once they’ve made a hiring decision, and at that point they want and need the information quickly. Doc: As I’ve said… roads? Where we’re going we don’t need roads. Verified First: Is there anything you would like to see changed when it comes to background screening? Mike Haberman: The EEOC put out guidelines on the effective use of background checks, and I’d like employers to follow those guidelines more. For example, a lot of companies have on their applications “Have you ever been convicted of a felony?” For a lot of companies, if you check that box, you don’t get the job. According to the EEOC guidelines, before recruiters eliminate someone because they’ve been convicted of a felony, we should consider the nature of the conviction, time, and whether or not the crime is related to the job. Doc: Well, good luck for all our sakes. Didn’t I already say that? Verified First: How do you think pre-employment screening will change in the future? Mike Haberman: Future generations will see the value of doing background checks, and they won’t immediately dismiss anyone with a criminal background. There will be more tolerance. Doc: Just like I said. Your future hasn’t been written yet. No one’s has. Your future is whatever you make it. So make it a good one.